'[Slade professor Henry] Tonks was anxious to encourage our interest in mural painting, and to this end had obtained permission to decorate the walls of a girls' club in Lillie Road, Fulham. About half a dozen students took part in the scheme. The compositions were done in egg tempera, on paper stretched on the walls. 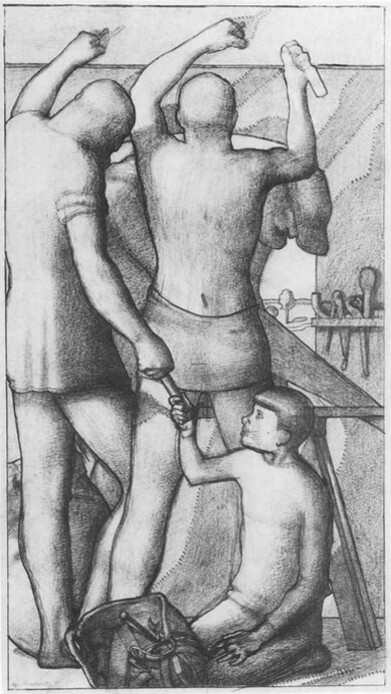 My contribution was a panel showing carpenters at work' (Roberts, Early Years, p. 14). The murals were already in need of some restoration in 1923, and when they were further damaged during the Blitz in 1940 it was decided to paint over them (John Sheppard, Bishop Creighton House 19082008: One Hundred Years of Work in the Community (London: Bishop Creighton House / Fulham and Hammersmith Historical Society, 2008), p. 36.